Archein Venomtongue is a rare Endurance creature card. It is part of the Core Set. In addition to the card's availability in the Core Set, one copy is included in the Telvanni Ambition theme deck. "My claws are sharp and thirsty!" "I raise the spine of battle!" 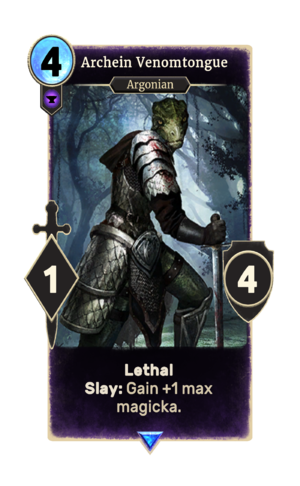 The card is named for the Archein, a tribe of Argonians who worked with the Dunmer slavemasters.